Posted on September 18, 2013 by Financial Underdog	in family, personal finance, Reviews. Why do you need personal finance software? I know it happened to me. I just couldn’t quite figure it out – money comes in, and even though I don’t spend much on anything, it’s always quickly gone. Some people call it paycheck to paycheck living. So, following the advice I picked up in multiple books, I’ve decided to track down my own money (sounds like an adventurous movie!). The usual approach is to purchase a computer program and upload transactions from your bank to get a realistic picture of where your money is going. You can also use spreadsheets (that sounds like fun, right?) if you’re good with Microsoft Office products. A good old notepad and a pencil will also do the trick if you are old-fashioned. For a couple of years by now, my wife and I been using Mint.com to keep track of all our expenses and plan our cashflow. Mint.com is an online website that lets you keep track of all your finances, keep an eye on your balances, plan and budget your expenses. Personally, I think tracking our expenses was one of the best moves we did to improve our finances – we felt like we got a pay raise by simply watching where we spend our money. What makes Mint the best personal finance software? Traditional software packages start around $50 and go up as high as $150. With Mint, you’ll never be asked to pay for anything. It doesn’t matter how many accounts you have, how many people in your family use it, or how many devices you use to access it. It’s free. Zero. Nada. My understanding is that Mint.com makes money mostly by referring clients to services – credit cards, GIC investments, life insurance, and others. I have no need for such referrals so I simply ignore small banners. Expensive software packages do offer an array of features. They’ll drown you in a sea of pie charts and break-even analysis. They’ll create complicated debt-repaying plans, and even project your expenses into the future. But I prefer simplicity over sophistication. I don’t need to see a 90-day breakdown of my expenses by category or graph representation of how little money I have. 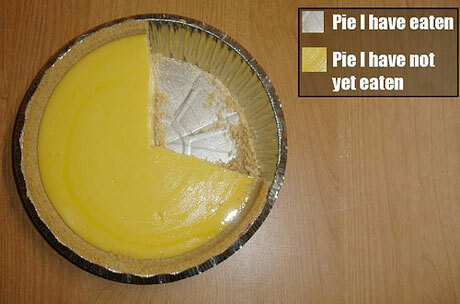 Thank you very much, I don’t need pie charts to explain it to me. I simply need to know where my money is going on a monthly basis, make sure I’m not overspending, and send me a quick alert if bank account dips below a set mark. Keep your pie charts, they’re not as yummy as they sound. You don’t have to upload or record transactions. This part is especially sweet for me because I just wouldn’t be able to keep up with the extra work involved in it. I know some people who use sophisticated programs (MS Money, Quicken, You Need A Budget to name a few), and all of them require you to manually download transactions or create transactions when you purchase things. To quote a recent viral video – Ain’t nobody got time for that! Mint.com automatically downloads all transactions from all accounts, and even does a decent job of classifying your expenses – like putting Superstore or Save-on purchases into “Groceries” spending categories. Quite often you have to change it, but it literally takes 5 seconds on any given day. When it comes to traditional personal finance software, you usually install it on your computer. In order to use it, you have to run it from that specific computer unless you buy a mobile application to sync your data. Also, if you’re need to install it on another computer – say you bought a new one or your wife would like to use it too – you’ll have buy additional licenses. Mint on the other hand can be open on any computer using a simple browser. Even if you are in Australia, you can quickly check it while sitting at Internet cafe. Mint has a lot of built in features that I wouldn’t be able to live without – it allows you to create and stick to a budget, reminders for bill payments such as credit cards, and sends you email alerts if you’re overspending in any category or your bank account is below your set minimum. Monthly budgets are very easy to set up especially if you spend some time and do it properly from the very beginning. Once you organized it the way you like it, setting up monthly expenses is a piece of cake and takes about five minutes every month. 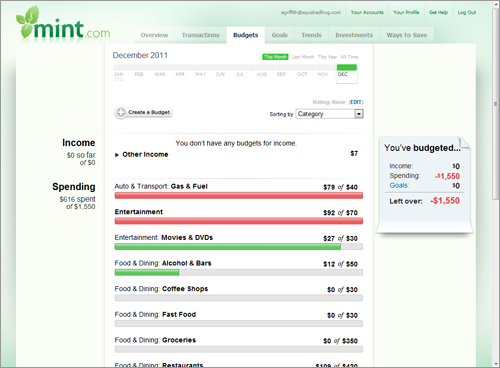 Unlike other personal finance software products, Mint allows you to customize your budget with ease. Its simplicity is what really appeals to me – instead of modifying a gigantic chart of accounts in MS Money, you simply add or delete spending categories on the fly. They also have an absolutely fabulous mobile application (or “app” as cool kids say) which comes in handy. We often use it when shopping to makes sure we have enough money in our budget and check account balances in one place (as opposed to visiting 2 or 3 banks online). Just like Mint itself, it’s completely free. Some people are concerned about privacy when giving away their bank information to an online service. And rightfully so – these days identity theft is a very serious problem. Personally, I have no such concerns. Mint.com is owned by Quicken – one of the largest personal finance software company in the world. If anything funny was going on with Mint, it would compromise millions of dollars they are making – companies like this take your privacy as serious as you or even more serious than you. Mint also allows you to add investment accounts, but I completely ignore this feature and simply use Mint to control my cash flow on a daily basis. I feel no need to check my investments every day. So, my preference is to leave investment side of our finances completely out. If somebody needs to keep track of their brokerage accounts, there are more sophisticated tools for it. If you use cash on daily basis, it might make things a bit more complicated – because in this case you’ll have to manually enter cash transactions into Mint. This can be rather painful for some people (including yours truly). Thankfully, me and my wife never use cash and switched completely to debit cards (and one measly credit card) and electronic payments between banks. This way Mint always captures all of our transactions, and lowers the amount of work we need to do to a minimum. Mint offers is a fantastic free tool to control your spending and watch your cash flow without paying for an expensive software package. You can use it anywhere you go – on your mobile (Apple or Android), on your home computer, or even your friend’s computer if you’re away (be sure to logout after you’re done). It will make budgeting and financial goal setting completely painless. If you like simplicity, you will like it. All of it makes Mint the best personal finance software in my opinion. Did I mention it’s free? Mint.com has a demonstration website you can visit before you sign up. It has made-up bank accounts and transactions to give you a feel for features and usability. Give it a whirl, check it out! Once you see how useful it is, just sign up and start using it. You won’t look back! What do you use to keep track of your finances? Please comment and let me know your experience!